Thanksgiving Eve, November 24, 1971. “Dan Cooper” (aka D.B. 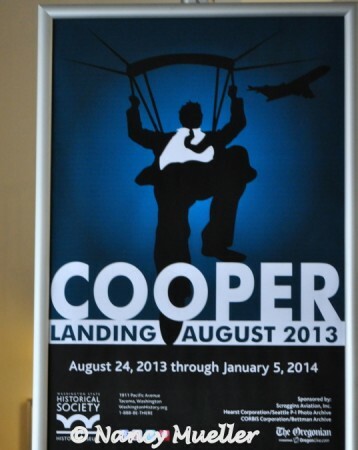 Cooper) boards Northwest Orient Airline Flight 305 in Portland, Oregon for what is normally a 30-minute hop to Seattle. But this is not a normal flight. After ordering a bourbon and Seven, he hands an envelope to stewardess Florence Schaffner. As the world now knows, the hijacking note inside that envelope triggered one of the most extensive manhunts and enduring mysteries of our time. Who was D.B. Cooper? What happened to him? Now you can delve into the mystery a little deeper at the Washington State History Museum’s new COOPER Exhibit in Tacoma, WA. Curators Gwen Perkins and Fred Poyner spent two years planning and gathering artifacts for the program. 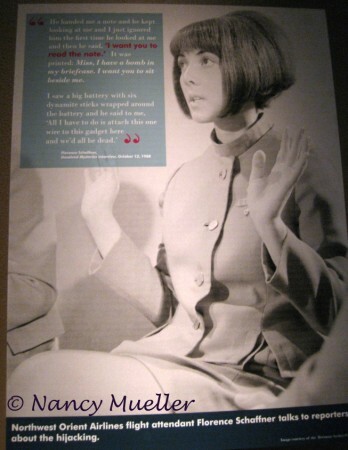 The result is a highly entertaining, interactive exhibit that takes visitors back to the 70’s where you can relive the dramatic play of events. Check in for your flight on the 4th floor and proceed to Gate 1, 2 or 3. Enter a mock up of the Boeing 727 cabin where mannequin D.B. Cooper sits in the back row, his briefcase nearby. Listen to the pilots’ conversation with air traffic control as you look out over the landscape below. After showing Flo the bomb in his briefcase, the hijacker listed his demands: two front parachutes, two back parachutes, $200,000. in a knapsack, food for the crew, and a refueling truck on the tarmac in Seattle. All this in exchange for the safety of the passengers and crew. 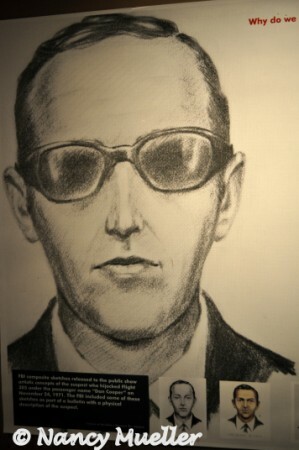 A pair of sunglasses shielded his eyes for the duration of the flight. 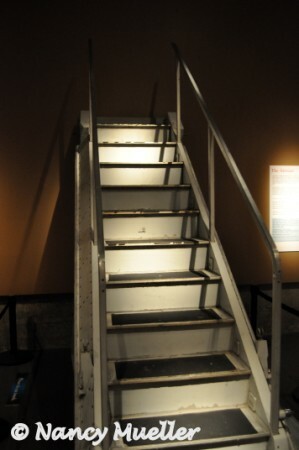 Later, somewhere between Seattle and Reno, Nevada, he lowered and descended the aft stairs. With briefcase in hand and the knapsack tied about him, D.B. Cooper jumped from the Boeing 727 into legend. Theories abound, but to date, the D.B. 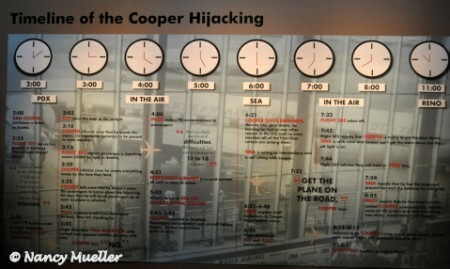 Cooper heist remains America’s only unsolved skyjacking crime. For many, his derring-do escape epitomizes the perfect getaway. No one got hurt, the hijacker remained cool, soft-spoken and well-mannered – and he dressed well in a dark suit, with white shirt and black tie, and a trench coat. For your own weekend escape, Tacoma’s Hotel Murano is offering a “Getaway with COOPER” package in conjunction with the exhibit. The exhibition opened August 24, 2013 and runs through January 5, 2014. For the full COOPER experience and an optional add-on fee, you can also book a simulated skydiving experience at iFly Indoor Skydiving, about 30- minutes from the hotel. At the exhibit you can try lifting the model 35-pound knapsack like the hijacker would have tied to himself before jumping. Then imagine skydiving with that extra weight. Do you think he could have lived to tell his tale? You be the judge . . . Many thanks to my hosts for the opportunity to experience the “Getaway with COOPER” package. Partial expenses were covered for the purpose of sharing the experience with my readers. What do you think happened to D.B. Cooper, wanderboomers? Share your best guess with us here. 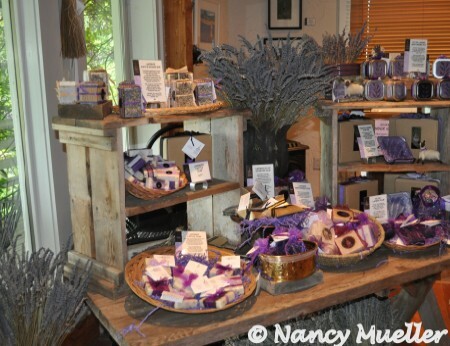 Lavender lovers rejoice! 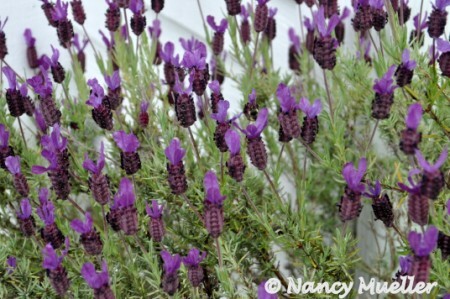 Only one more month until the annual Pelindaba Lavender Festival on beautiful San Juan Island. “Pelindaba” comes from the Zulu word meaning “a place of great gatherings.” With a nod to his South African roots, owner/founder Stephen Robins also chose a name that captures his vision of the certified organic farm. Robins must be doing something right. Viewers of King 5 Evening Magazine, an NBC affiliate, recently crowned Pelindaba “Best Public Garden” for the fifth year since 2009. Feed the senses with a stroll through the scented fields, of course. But also be sure to sample the lavender cookies, ice tea and ice cream. Mmm . . .
To find out more about the history of the farm, view the multi-media exhibits on site. 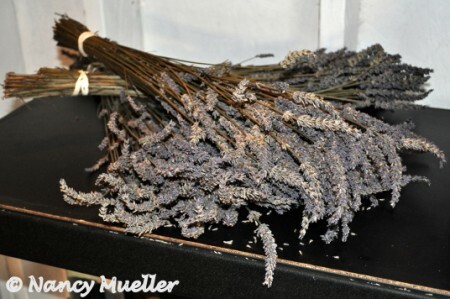 Tour the on-site distillery to learn how essential oils are extracted from the flowers. Learn how to make beautiful crafts, wander through the demonstration garden, or create your own lavender bouquets to bring home. All in all, what a lovely way to spend a summer’s day . . . The festival runs the weekend of July 20th – 21st 2013, though visitors to the farm are welcome from May – October. 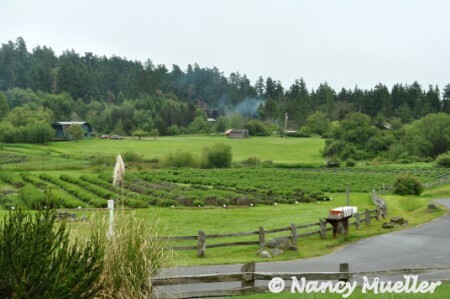 To reach Pelindaba Farm, take the Washington State Ferry from Anacortes, WA or Sidney, BC; the Victoria Clipper from Seattle, WA or Victoria, BC; or fly with Kenmore Air or San Juan Airlines. 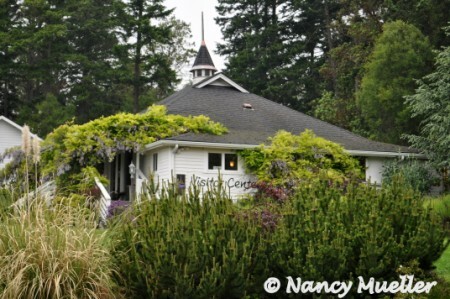 Pelindaba is located one block from the Friday Harbor ferry landing at 150 First Street. What are your favorite summer festivals, wanderboomers? Want to explore a visually stunning byway? Meander along the magnificent Columbia River as it winds its way from Portland to The Dalles, Oregon to see what I mean. 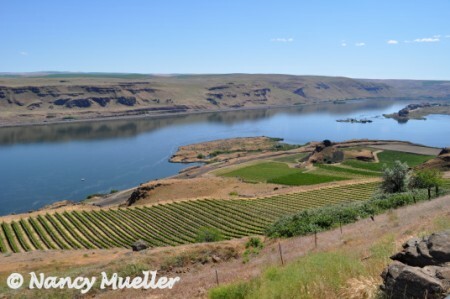 Go on a cruise or drive along the Columbia River Gorge. Take several hours or several days to experience a variety of vistas and activities. What kinds of activities? The Columbia River Gorge creates a natural wind tunnel favored by windsurfers, for starters. 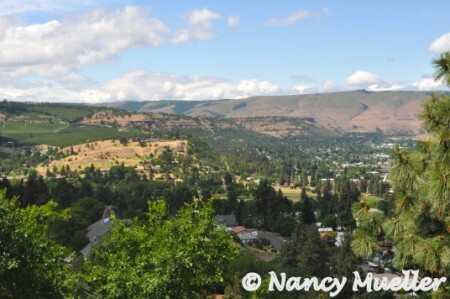 Also, outdoor enthusiasts love the easy access to camping grounds, hiking and biking trails in The Dalles. 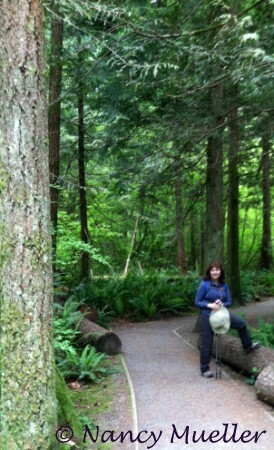 On my late May visit I enjoyed a windy wildflower walk through the Tom McCall Preserve. A guided hike and tour of historic petroglyphs at Horse Thief Lake State Park came next. To view the petroglyphs which Native Americans consider sacred, visitors must be accompanied by a park ranger. Start at The Discovery Center and Museum for an overview of the area’s historical and cultural influences. 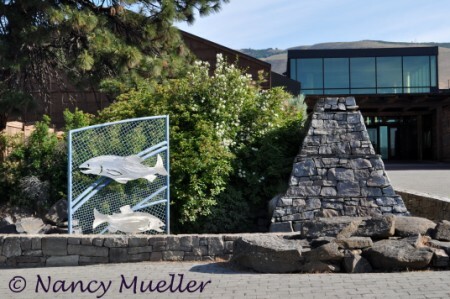 The museum’s inspired award-winning design takes full advantage of its natural setting next to the Columbia River. Spend several hours wandering through the exhibits, like an early 19th century town and the cargo of Lewis & Clark. View a raptor presentation and take time to stroll the museum grounds. How many of the 40 identified native plant species can you find? The Dalles’ downtown display of Murals combines art and history by illustrating stories of famous historical events. Purchase a key at The Dalles Chamber of Commerce to activate a talking box at most locations for a voice-recorded description of the events. 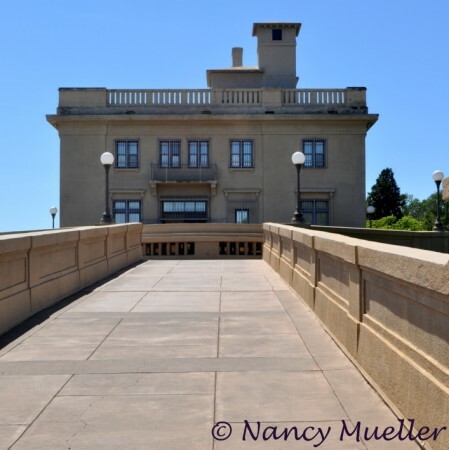 Maryhill Museum of Art stands out on a bluff overlooking the Columbia River on the Washington State side of The Dalles. Originally, railroad executive Samuel Hill intended the building as his hilltop mansion. But its remote location and heavy construction costs derailed his ambitious plans. Today the museum features works by Auguste Rodin and Orthodox icons contributed by the Queen of Romania. The collection also includes European and American paintings and artifacts of indigenous people of North America. When you’re ready for a break from viewing the collection, head outside for lunch. 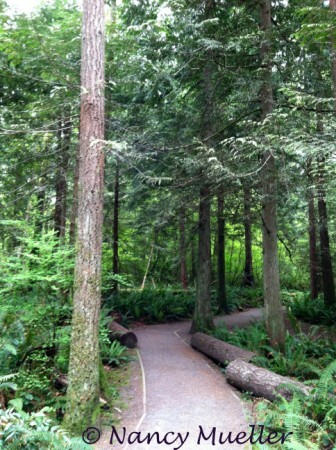 Picnic under a canopy of trees on the grounds or on the café deck overlooking the Columbia River. 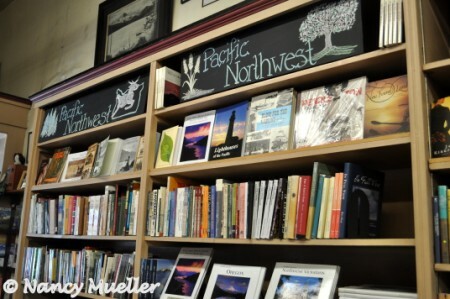 Downtown The Dalles has a treasure in Klindt’s Bookseller’s, the oldest bookstore in Oregon. First opened in 1870, today the bookstore retains original floors, cabinets and bookshelves – and maybe even the ghost of Edna Weigelt who owned and operated the store from 1927 until her death in 2003. Pay a visit to find out for yourself . . . I also love to discover unique shops that carry a little bit of everything because you never know what you might need until you see it. Am I right? 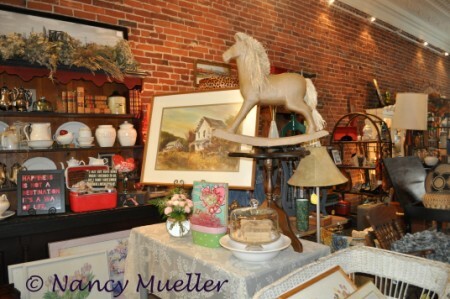 Happily, you’ll find what you didn’t know you needed at Cowgirl Bloomers, right next door to Klindt’s Bookstore. 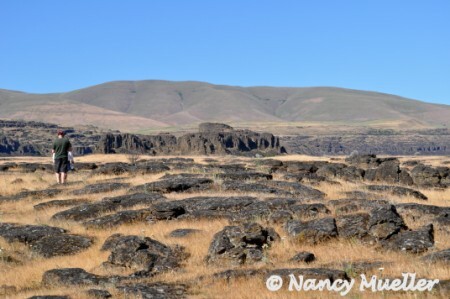 Still so much more to discover in The Dalles . . .
Summer’s just a hop, skip and jump away! Where will you go to play this summer, Wanderboomers? 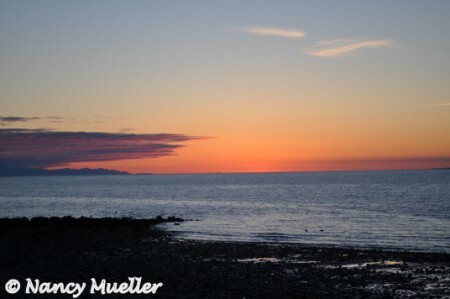 For this week’s Photo Friday, here’s a sunset scene from Whidbey Island, WA to carry you into the weekend. Ahh . . .
You can find more fun photos at Delicious Baby. What’s your favorite sunset memory, Wanderboomers? Okay, time to dust off those hiking boots and poles and start taking to the trails! Adventurous wanderboomers in the Pacific Northwest will find plenty of hiking trails on Tiger Mountain to satisfy a variety of skill levels. 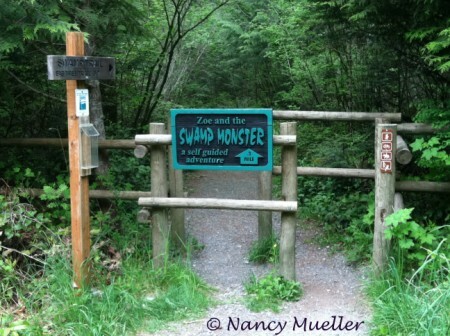 Swamp Monster Trail on Tiger Mountain is a kid-friendly, young-at-heart, easy-on-the-knees kind of hike. Along the mostly flat 0.6 mile trail, hikers can read a series of seven storyboards that tell the tale of Zoe the Raccoon, who fears that a swamp monster lurks nearby. Should you be worried about a possible sighting? Well, anything’s possible in the forest of the Sasquatch or Bigfoot, of course. But let’s just say that I didn’t catch a glimpse of anything out of the ordinary on this particular day. . .
From Seattle, head East on I-90, to Exit 20. At the end of the exit ramp, turn right, then right again which brings you onto the access road for Tiger Mountain that leads to High Point trailhead. Keep on driving up the gravel road, past the overflow parking area, until you reach another parking area for the trail. For more Photo Friday fun, check out Delicious Baby. What about you, wanderboomers? What’s your favorite place to hike?